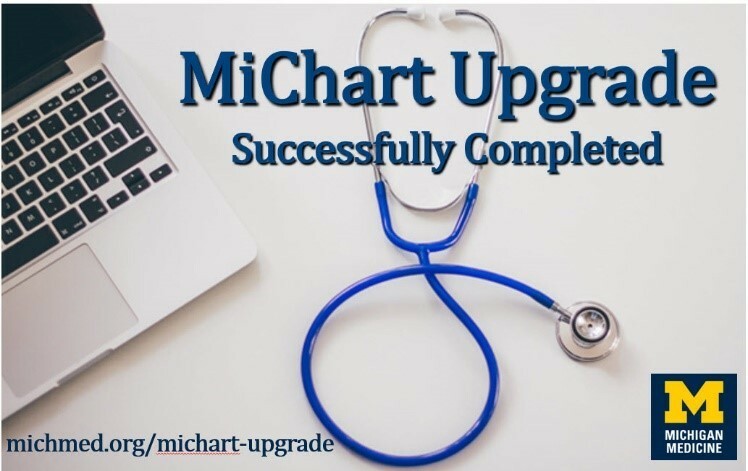 The latest system upgrade for MiChart, Michigan Medicine’s electronic health record, was successfully completed at 5 a.m. on Sunday, April 14. Downtime was a total of three hours, as planned. There were no major issues for inpatient services on Sunday nor on Monday morning when ambulatory clinics and billing offices opened. Ability to review, assess, add and remove Lines, Drains and Airways (LDA) with the interactive LDA Avatar. Streamlined Care Plan documentation for Inpatient Nursing with ability to document details all on the same screen and “pend” summary notes. Option for providers to integrate clinic and surgery case schedules with their Outlook/Exchange calendars and set up push notifications for InBasket messages in Haiku and Canto. Updates are being reported in the “Daily Flash” newsletter which is posted to the MiChart Upgrade webpage. Those who have not completed their eLearning may do so within the MLearning portal. To access the upgrade tip sheets and presentations, visit the Upgrade Training Resources webpage. Many thanks to all teams who contributed to making the Go-Live a success!